I reviewed a very cool little device yesterday that is about the size of a lipstick case, and yet it is a professional audio interface you can put in your pocket (if you need to) and take with you wherever you go. It’s called the CEntrance (no, that is not a typo) MicPort Pro. You plug any standard microphone (by “standard” I mean witha 3-pin XLR connector) into one side of the MicPort, and plug the MicPort (via the included low-noise USB cable) into a USB port on your (or anyone’s – since it’s so mobile) computer. 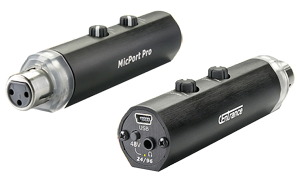 The MicPort has a phantom power switch you can use for your condenser mics. It also has a headphone input that allows for zero-latency monitoring. All that stuff is on the tip of one end of the “lipstick case.” On the side are two knobs, one for controlling the input gain and the other for controlling headphone volume. It has a high-quality A/D converter and preamp, which puts it into the category of “professional recording” in my book. Voice Recording Studio – What do You Need?